planetary unity. I receive you now into my Sixth Chakra, as you open your Sixth Chakra to me. My beloved Himalayas are the “roof of my world,” and the Eyes of my Soul. In fact, they are my Third Eye. As you merge your “person” into my “planet,” your Planetary Consciousness will truly SEE the FACE of SOUL wherever you look. 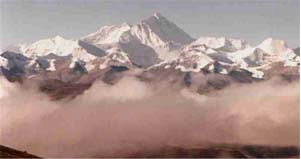 Tibet is an area that has always cherished consciousness expansion and travel into the inner, higher planes of reality. It is here that I, Gaia, Open MY Third Eye to regain MY multidimensional VISION. The Sixth and Seventh Chakras have a polarity, but function in an androgynous fashion. As you have seen, the male-polarized, outflow planetary chakras are mountain peaks which rise from my surface like a phallus. On the other hand, the female-polarized planetary chakras are indented into my earth body like a womb. The Himalayas is a mountain range in which there are both peaks and valleys. Yet, the primary, female polarity of this chakra is represented by the “family” of peaks and valleys. 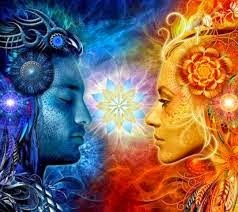 The polarities are the same for your personal chakras in that your sixth and seventh chakras are more androgynous in nature. The Sixth Chakra represents the first step towards your journey Home. Now that you have merged this chakra with your Seventh Chakra to open your Third Eye, you have activated your multidimensional senses and perceptions. You are no longer limited by the physical illusions of separation from others and from SELF, and you will never again experience physical life in the same manner. You are out of your “box,” and nothing, or no one, can put you back. Your Third Eye meditations also assist you in activating your “junk” DNA. When you activate what your scientists have labeled “junk DNA,” you begin your return to twelve strands of DNA, rather than the two strands which have limited your consciousness to the 3D frequency net around our planet. You know that it is not within my “Nature” to have life forms that only use 10% of their brain or 10% of their DNA. Fortunately, your scientists are also expanding their consciousness to realize this fact, and more “scientific” research is being done to “prove” what my Priests and Priestesses have always KNOWN. The pituitary gland, which is associated with this chakra, is your master gland and regulates many of your bodily functions, which further prepares your body for transition into Lightbody and your consciousness for Planetary and Galactic Consciousness. My dear Awakened Ones close your eyes and take a long moment to focus on your Third Eye. Breathe in from your Heart Chakra and out through your Heart Chakra to ground yourself. Then, breathe in from your Crown Chakra and out through your Third Eye to raise your consciousness. From your “peak consciousness,” visualize yourself descending into my deepest core. FEEL your Essence within mine once again, as we swirl and dance into the Core of our One Being. 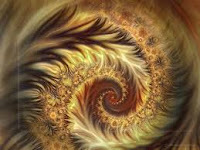 Down, down, down into the Core of LIFE you swirl. Now, as slowly as a feather caught in an updraft, float up from my core and into my Sixth Chakra, the Himalayan Mountain Range. The journey from the core of my body to the roof of my world is long, indeed, but it takes no “time,” as your consciousness is now beyond the third dimensional confines of time and space. Feel yourself standing on the highest peak of the Tibetan Himalayas. Attune to the consciousness of this mountain range. Life is simple here. Nature is grander than humanity, and Spirit is closer than Matter. From your position at the top of the world, you can clearly see the Rainbow Bridge to the higher worlds. Take a long moment to walk across the Bridge. Experience the infinite possibilities of the realities that it holds and the memories of your many journeys into the upper fourth dimension that it awakens. You are moving beyond the fourth dimension, into the fifth dimensional worlds and beyond. “I am your Lightbody, ready to burst forth into your everyday life. SMELL the scent of the beyond. Acknowledge my presence within you, and I will show you TRUTH. As you merge into Oness with your SELF, accept my Sixth Chakra, the Himalayan Mountain Range, into your opened Third Eye, and as I accept your Third Eye into my Sixth Chakra, you will gain full access to Planetary Consciousness and I, Gaia, shall gain full access to the Collective Consciousness of humanity. Our consciousness is blended, WE are Planetary Consciousness. YOU are the planet. FEEL the Earth about you like you feel your human arms and legs. Know that YOU ARE Gaia, and I AM you.